A Sterling Silver Compass Rose Pendant Necklace of elegant and historical design. The design for this beautifully executed sterling silver compass pendant comes from a 16th century map of the New World. directions. ( for more detail on the compass rose click on 'Origins of The Compass Rose') The photo shows each side of the silver compass rose pendant. The C-1 Compass Rose is approximately 20mm in diameter (about the size of a quarter). 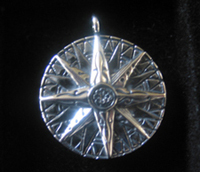 The photo shows each side of the silver compass rose pendant. The C-1 Compass Rose Pendant is approximately 20mm in diameter (about the size of a quarter). The Compass Rose Pendant is set with a working compass and is hand cast in the United States.